What do Woodlynde alumni cite as the greatest source of their success in college and beyond? The consistent answer is, by far, their teachers. Woodlynde's expert and caring teachers engage with their students as learners and as people, helping them develop strategies for their distinct learning styles, fearless self-advocacy, and robust confidence that serves them throughout their lives. 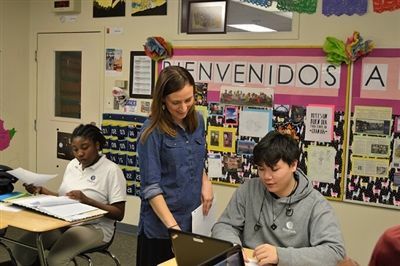 Woodlynde teachers provide our students with academic, social, and emotional support services that are tailored to their individual learning needs and that fully integrate with our rigorous college prep program. Along with trained learning specialists and school counselors, Woodlynde's faculty members collaborate across disciplines and divisions to shape each student's unique educational path. 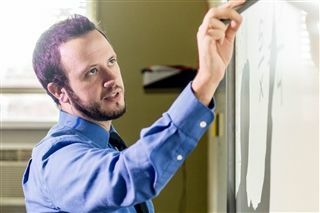 As professionals in their field, Woodlynde faculty not only engage in extensive professional development to continuously hone their knowledge, skills, and passion for working with students who learn differently, they are also sought out as experts by their colleagues in the regional educational community. Beyond all else, Woodlynde teachers believe in their students, every step of the way. Learning Specialist Mrs. Meers shares that mindfulness is a simple technique that emphasizes paying attention to the present moment which can help minimize anxiety and increase happiness. "Their creativity and desire to improve is inspiring. They motivate me to teach better and smarter." Mrs. Clark states that one of her favorite things about Woodlynde is that there is no one way to learn--everyone is different and Woodlynde is a beautiful example of what education can and should look like for students! Mrs. Baver states that she is so grateful for Woodlynde’s commitment to diversity and inclusivity so that our students know this is a school where they can all feel welcome. 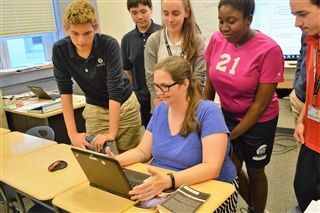 Ginny Byrne, Upper School English Teacher, has been teaching at Woodlynde School for 14 years. Byrne believes Woodlynde’s warm sense of school community, the support from her colleagues, and how the faculty at Woodlynde are here to serve the individual needs of each and every one of their students are what truly makes Woodlynde such a special place. 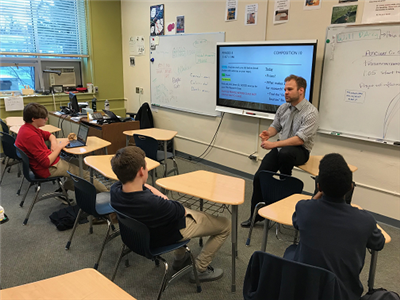 Upper School Math Teacher Sean Sweeney is one of only 40 teachers in the country accepted into the Desmos Teaching Fellowship. Wilson Reading System® Certified Teacher; K-12 Reading Specialist Certification, Level II; University of Massachusetts, M.Ed. in Educational Administration, Certificate of Graduate Studies in Reading; Franklin & Marshall College, B.A. ; at Woodlynde since 2008. Wilson Reading System® Certified Teacher; B.S. and M.S. from Saint Joseph's University; K-6 Elementary Education Certification; K-12 Special Education Certification; K-12 Reading Specialist Certification; Previously Upper School Learning Specialist at Woodlynde for three years before working as the Learning Support Specialist at Academy of Notre Dame de Namur for one year; at Woodlynde since 2015. Eastern University B.A. in Marketing; at Woodlynde since 2017. B.S. and M.S. from Saint Joseph's University; K-4 Elementary Education Certification; K-8 Special Education Certification; K-12 Reading Specialist Certification; Previously Long Term Substitute in 2nd and 5th Grade at Woodlynde. Wilson Reading System® Certified Teacher; B.A. in History and Secondary Education from the University of Mary Washington; M.A. in Education, content in Special Education from Villanova University; Certification 7-12 Social Studies and Special Education; TESOL/TEFL Certified; Previously worked at Phoenixville Area High School; at Woodlynde since 2014. Wilson Reading System® Certified Teacher; Accredited Wilson Dyslexia Practitioner; Villanova University, B.A. in General Arts; at Woodlynde since 2002. Former aide at Ithan Elementary School in Radnor School District. Previously 20 years in marketing communications for organizations including The Vanguard Group, Peat Marwick Mitchell, Woodward and Schaefer Public Relations, National Public Radio, and Triangle Publishing Group (TV Guide). 7-12 Biology Certification; 7-12 General Science Certification; West Chester University, M.S. in Biology; B.S. in Education; Recipient of the 2007 McCord Symposium Award for Distinguished Teachers; Recipient of the Distinguished Teacher/Service Award Winner 1986-1987; Honorary Alum Award, 1998; at Woodlynde since 1976. 7-12 English Certification; Bryn Mawr College, B.A. in English; at Woodlynde since 2004. Wilson Reading System® Certified Teacher; 7-12 English Certification; St. Joseph's University, M.S. in Secondary Education; B.A. in English; at Woodlynde since 1998. B.A. in Spanish and Youth Ministry from Eastern University; Master's in Multicultural Education with K-12 Spanish teaching certification from Eastern University; Previously Teacher Assistant at a charter school in Philadelphia. Widener University, M.B.A.; Villanova University, B.S. ; Previously taught at Chichester Middle School and Chichester High School; Currently working on M.S. in Education at Cabrini College; at Woodlynde since 2004. Wilson Reading System® Certified Teacher; K-6 Elementary and N-12 Special Education Certification from Eastern University, B.F.A. in Graphic Design from The College of New Jersey, M.S. Ed. in Reading along with K-12 Reading Specialist Certification from West Chester University. Previously: 7th, 8th Grade Learning Specialist, and Kindergarten Teacher; served as substitute teacher in Substitute Teacher Service, Inc in Media and the Chester County Intermediate Unit; Graphic Designer in Boothwyn, PA; Varsity Assistant Field Hockey coach at Penncrest High School 2006-2011, and Assistant Lacrosse coach at Swarthmore College 2007-2012, Varsity Head Lacrosse Coach for Woodlynde 2012-2013. At Woodlynde since 2010. Wilson Reading System® Certified Teacher; K-12 Spanish Certification; B.A. in Spanish from Ursinus College; at Woodlynde since 2012. University of Pennsylvania, B.A. in Classical Studies, minor in Education; at Woodlynde from 1971-2004, returned in 2006. Bachelor's degree from Temple University; Elementary, Special, Mid-Level Education Certifications; Previously Middle School English, Reading, and Science Teacher in the Pennsbury School District; At Woodlynde since 2015. Muhlenberg College, B.A. in English; Woodlynde Alumnus ‘91; Previously: journalist for 12 years; Won awards for news and feature writing, and wrote a national exclusive; at Woodlynde since 2007. Previously 7th and 8th Grade Learning Specialist at North Brandywine Middle School; Degree in Early Childhood, Elementary, and Special Education from Neuman University; At Woodlynde since 2012. Wilson Reading System® Certified Teacher; 7-12 English Certification; Bloomsburg University, B.A. in English and Creative Writing, B.S. in Secondary Education; Previously English and Language Arts Teacher at North Penn High School. At Woodlynde Since 2012. Wilson Reading System® Certified Teacher; B.S.Ed. in Mathematics from West Chester University; Previously taught at Phoenix Academy in Lancaster, PA. At Woodlynde since 2013. Microsoft Certified Systems Engineer Certification; Microsoft Certified Professional; Pennsylvania State University, B.S. in Music Education; at Woodlynde since 2004. Colby College, B.A. in English; Member of the Association of Fundraising Professionals; Previously: Director of Institutional Advancement at Philadelphia Theatre Company; Executive Director of the American Diabetes Association in Central/Southeastern Pennsylvania and Southern New Jersey; Director of Development of the Opera Company of Philadelphia; The Museum Deputy Director at the Baltimore Museum of Art; and as the Deputy Director of Development at the Philadelphia Museum of Art; at Woodlynde since 2010. George comes to Woodlynde having successfully served as the headmaster for Moravian Academy in Bethlehem, PA, from 2007-2016 and the headmaster at Wooster School in Danbury, CT, from 2003-2007. Earlier in his career, George served as upper school head at Greenhill School in Dallas, TX, and the Bullis School in Washington, DC. He also led marketing efforts at both Moravian and Queen Anne School and has enjoyed fundraising in his roles as a head of school, which he describes as "just one more important way to connect to the community." A strong advocate for students, he also established learning assistance programs for students with learning differences at both Wooster and Bullis. University of Delaware, B.A. ; The Restaurant School of Walnut Hill, A.A.S.T. ; at Woodlynde since 2008. Wilson Reading System® Certified Teacher; K-6 Elementary Education Certification, Level II; 7-12 English Certification; K-12 Reading Specialist Certification; Harvard University, M.Ed. in Language and Literacy; M.Ed. from West Chester University; University of Pennsylvania, B.A. in Elementary Education; at Woodlynde from 2002-2004 and returned in 2006. 7-12 English Certification; Columbia University, M.A. ; Skidmore College, B.A. ; Previously: In NY: The Center School, Middle School Humanities Teacher; High School for Art and Design, High School English Teacher; Camden Middle School, 8th Grade English Teacher; In PA : Germantown Academy, Middle School English Teacher; at Woodlynde since 2006. 7-12 Social Studies Certification; 7-12 English Certification; Temple University, B.S. in Secondary Education; at Woodlynde since 2014. Wilson Reading System® Certified Teacher; Bloomsburg University, B.S. in Elementary and Special Education; Previously: Resource Room Teacher at Penncrest High School, Media, PA; at Woodlynde since 2001. Wilson Reading System® Certified Teacher; K-6 Elementary Education Certification; Cabrini College, M.Ed. ; B.S. ; at Woodlynde since 2003. Wilson Reading System® Certified Teacher; K-6 Elementary Education Certification, Level II; Middle Level Citizenship Education 7-9, Level II; Essentials of Human Resource Management Certificate, Villanova University; Cabrini College, M.Ed. ; B.A. ; Recipient of the Outstanding Teacher Award by the National Society of the Sons of the American Revolution; at Woodlynde since 1998. Wilson Reading System® Certified Teacher; K-12 Reading Specialist Certification, Wilson Teacher-Trainer; University of Pennsylvania, M.S. in Education, Reading and Literacy; B.S. in Education; Previously reading consultant at Benchmark School in Media, PA, and in private practice as The Strategic Reader in Paoli; Speaker at national conferences for the International Dyslexia Association and the National Association of Independent Schools; Board member for the Pennsylvania Branch of International Dyslexia Association; “Take the Lead” Award from the Girl Scouts of America; at Woodlynde since 1987. Wilson Reading System® Certified Teacher; Wilmington University, M.Ed. in Elementary Education K-6; West Chester University, B.S. ; Previously taught in the Delaware school system and was a YMCA Youth Wellness Director; at Woodlynde since 2014. La Salle University, M.S. in Speech-Language Pathology; North Carolina State University, B.S. Textiles and Apparel Management; at Woodlynde since 2014. B.A. from ﻿Bucknell University: Master's Degree from Columbia University; Previous Summer Camp Counselor at Woodlynde from 2011-2015; Pre-K through grade 2 certification in Pennsylvania; Grades 1 through 6 General and Special Education Certification in New York. At Woodlynde since 2017. Athletic Trainer Certification; Licensed Athletic Trainer; Elon University, B.S. in Sports Medicine - Athletic Training, B.S. in Physical Education; Woodlynde Alumna '99; Previously: Catawba College, assistant/intern athletic trainer; approved clinical instructor; at Woodlynde from 2003 - 2006, returned in 2007. Wilson Reading System® Certified Teacher; K-6 Elementary Education Certification; Cabrini College, M.Ed., Millersville University, B.A. Psychology; at Woodlynde since 2007. Cabrini College, B.S. ; Woodlynde Alumnus ‘95; at Woodlynde since 2006. Elizabethtown College, B.S. in Social Studies Education; At Woodlynde since 2012. Drexel University, B.S. Awarded PA Department of Education Keystone Technology Integrator, summit attendee; Previously: taught at Valley Forge Military Academy, Associate Professor Computer Science; Education Technologist; IT Contractor, Bowker & Associates; Systems and Applications Engineer, Hewlett Packard Corporation; Programmer, City of Philadelphia Water Department; volunteer with Greater Philadelphia Cares and WePAC; at Woodlynde since 2008. Certified Pediatric Nurse; R.N. from Gwynedd Mercy University; B.A. from Villanova University; Previously a nurse at Children's Hospital of Philadelphia; at Woodlynde since 2015. Penn State University, B.S. Health and Physical Education. Dean of Students and Director of Operations. Previously head of the physical education department, director of athletics, teacher, and coach. At Woodlynde since 1980. Wilson Reading System® Certified Teacher; Widener University, Bachelor's degree in Elementary Education (K-6), Master's degree in Special Education (K-12); Graduate Certificate in Autism from Arcadia University; Previously Director of a Montessori Preschool; At Woodlynde since 2012. K-12 Music Certification Level II; West Chester University, Kodaly Certification; Boston University, D.M.A. (Doctor of Musical Arts); Temple University, M.M. ; University of the Arts, B.M. ; National Endowment for Humanities grant recipient; Finalist, National Guitar Summer Workshop Concerto Competition (1995), First Prize, Philadelphia Classical Guitar Society Competition (1993); Previously: taught guitar at Shipley School and Harcum College; taught guitar and music history at Temple University, Ester Boyer College of Music; Adjunct Professor at Montgomery County Community College; at Woodlynde since 1999. Wilson Reading System® Certified Teacher; PA Certified English Secondary Education 7-12, Special Education N-12, M.S. in Education from Cabrini College; Previously English and Language Arts teacher at Pennsylvania Virtual Charter School; at Woodlynde since 2013. 7-12 Social Studies Certification; Franklin Pierce University, B.A. in American Studies; at Woodlynde since 2006. K-6 Elementary Education Certification, Instructional II; 7-9 Middle School Certification in Math, Science, Social Studies, and Special Education with an Endorsement in Autism Spectrum Disorders, Instructional II; Saint Joseph's University, M.S.Ed in Special Education; University of Pennsylvania, M.S. in Education. ; Bryn Mawr College, B.A. ; Previously taught Fifth Grade in Chester Community Charter School in Chester, PA.; at Woodlynde since 2008. Pennsylvania State University, B.S. ; at Woodlynde since 2005. Licensed Professional Counselor; K-6 School Counseling Certification; Villanova University, M.S. In Counseling and Human Relations; Loyola College, B.A. in Psychology; at Woodlynde since 2006. K-12 French Certification, Level II; Widener University, M.Ed. in Secondary Education; B.A. in French; taught Middle and Upper School French for 9 years at Woodlynde (for 5 years also a college counselor); Previously: taught French in Exeter Township Area School District and Palmyra Area School District; Member of (NACAC) National Association for College Admission Counseling, (PACAC) Pennsylvania Association for College Admission Counseling, Communications Committee of PACAC; at Woodlynde since 1997. 7-12 Mathematics Certification; B.A. in Mathematics from Immaculata University; Recipient of Anderson Medal for Excellence in Mathematics; at Woodlynde since 2014. K-6 Elementary Education Certification; Moravian College, B.A. in Elementary Education; 1992 Woodlynde Teacher of the Year Award; at Woodlynde since 1985. K-12 Special Education Certification; 7-12 English Certification; K-6 Elementary Education Certification; LaSalle University, M.Ed. ; B.A. in English; at Woodlynde since 1996. Wilson Reading System® Certified Teacher; K-12 Special Education Certification; K-12 Reading Specialist Certification; Peabody College of Vanderbilt University, M.S. ; Duke University, B.A. ; at Woodlynde since 2003. B.A in Secondary Education and History from Cabrini University; previously Long-Term Substitute at Woodlynde School. Responsive Classroom certification; at Woodlynde since 2016.